Today, the whole world is filled with millions of electronic devices. Tablets, laptops, smartphones and other mobile gadgets - without them, people can no longer imagine their life. All this leads to an increase in competition in the software market, especially operating systems. 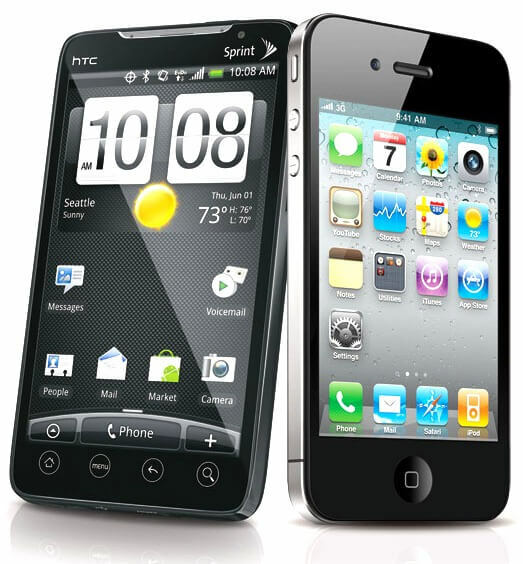 Of the operating systems for mobile devices on the advanced competition are iOS and Android. iOS is the brainchild of a famous company Apple, and the equally well-known company Google is engaged in the development of the Android operating system.. Both systems have their loyal fans, their pros and cons. We will try to compare them in some fundamental parameters and, to some extent, answer the question - which is better: Android or iOS. The first parameter in our list can be decisive for many. A detailed comparison of the price of Android devices and their rivals from Apple can not even be carried out - devices with an apple are three to four times more expensive than their counterparts. This is a controversial issue, because it is subjective. It all depends on the tastes of the individual user. But instead of design, you can compare interfaces. Here, Android devices need to be preferred, since they have a much larger set of widgets, and installing them is much easier. In the same Apple devices, in addition to a limited number of widgets, they are all in a special menu, which is rather inconvenient. Android, no doubt, in this regard is much more flexible. Live wallpapers, custom screens and, of course, launchers - the user has many options for customizing the interface. You can replace system applications with third-party applications (browser, message manager, etc.). The only question is why? After all, the quality of third-party applications can be much worse. With iOS, settings and interface changes are traditionally limited - you can only change the order of what is on the screen. Oh yeah, another wallpaper. They can also be made dynamic. So iOS strongly limits the user in wanting to customize the interface. But in this you can see a plus - the work of iOS is more stable. For both operating systems there is a sufficient number of applications. But in reality, only Android can be considered a multi-tasking system. In order to open a new application, in all iPhones, up to version 4S, you need to close the old one. Managing open applications on Android is about the same as on a regular computer. As it seems to many users, games on iOS are much more than on Android, and they are better developed. Another plus of Apple - there are new items appear earlier. The undoubted advantage of many applications for Android - their free. Almost all applications for iOS are paid. By the way, the App Store offers much more applications than the Google Play Market. Interestingly, those applications that are completely free on the Google Play Market are already worth the money on the App Store. To connect to other devices, devices on Android use standard interfaces. In order to throw off any file, including the application, on the Android device, you do not need any tweaks. It is enough to be sane, to have a memory card in the device and a regular USB cable. The vast majority of such gadgets computer with a modern operating system recognizes as a regular drive. Even without having to install additional drivers. With Apple gadgets, everything is much more complicated. For switching there are developed their own, proprietary interfaces. Often there may be a need for all sorts of adapters that are quite expensive. As for the task of copying files from a computer to an Apple device, then this requires special software. It is called iTunes and requires registration and configuration over the Internet. Many users do not like it, because this procedure takes too much time. However, these restrictions can be circumvented if you make the so-called jailbreak. This operation provides access to the initially closed file system of iOS devices. The official position of Apple is that the jailbreak is an illegal procedure and the device on which it was held is no longer subject to repair under warranty. The Russian legislation considers otherwise and in the Russian Federation a device with a jailbreak is required to be repaired. Both systems are perfectly implemented work with social networks and browser support. But, if we talk about network connections via Wi-Fi and 3G, then here iOS is definitely faster. Accordingly, it is more comfortable to work with the Internet on Apple devices. iOS is a proprietary, closed operating system, making applications developed for it more stable. Another weighty plus iOS - is the complete absence of viruses. Android can not boast about it. But this situation is quite reparable. You just need to install antivirus software that will check all applications during the installation period. Comparing iOS and Android operating systems with this parameter shows a clear advantage of iOS. As practice shows, the intensive use of iOS-devices during the day is unlikely to lead to the complete discharge of the battery. What about working on Android devices can not be said. A huge number of free applications. To remove an application, you need to do a lot of gestures. It also happens that after the game is deleted, its cache continues to occupy memory. An important advantage is the complete absence of viruses. In comparison with the android quite quiet sound.